Pulled Pork Sandwich: Hickory-smoked pulled pork, Gomez BBQ sauce, and house-made pickles on a Circle City Sweets bun. Brisket Sandwich: Smoked brisket, Gomez BBQ sauce, and house-made pickles on a Circle City Sweets bun. BB-Cuban: Batch No. 2 Whole Grain Mustard, house-smoked ham, pulled pork, Gomez BBQ sauce, house-made pickles, coleslaw (optional), and melted Swiss cheese on a Circle City Sweets bun. Smoked Sausage Wrap: Smoked andouille sausage, ricotta cheese, diced tomatoes, arugula, honey-pepper mustard, Gomez BBQ sauce, and shredded cheese wrapped in a tortilla. BBQ Bowl: White rice, baked beans, pulled pork, Gomez BBQ sauce, coleslaw, and pork rind dust. Hot Brown: Smoked turkey, tomatoes, melted Swiss, cheese sauce, and bacon on a thick piece of toast. Candy Bacon BLT: House-made candied bacon, arugula, tomatoes, and Swiss cheese on rye bread. Meatloaf Sandwich: Smoked meatloaf, Gomez BBQ sauce, potato chips, and mashed potatoes on a Circle City Sweets bun. Biscuits and Gravy: House-made gravy on two biscuits, topped with Cholula hot sauce and green onions. Gumbo: Smoked sausage, crawfish, pulled pork, celery, and tomatoes in a pork bone broth, served on a bed of rice. Chicken Salad Sandwich: Smoked chicken salad, tomatoes, arugula, and Swiss cheese. 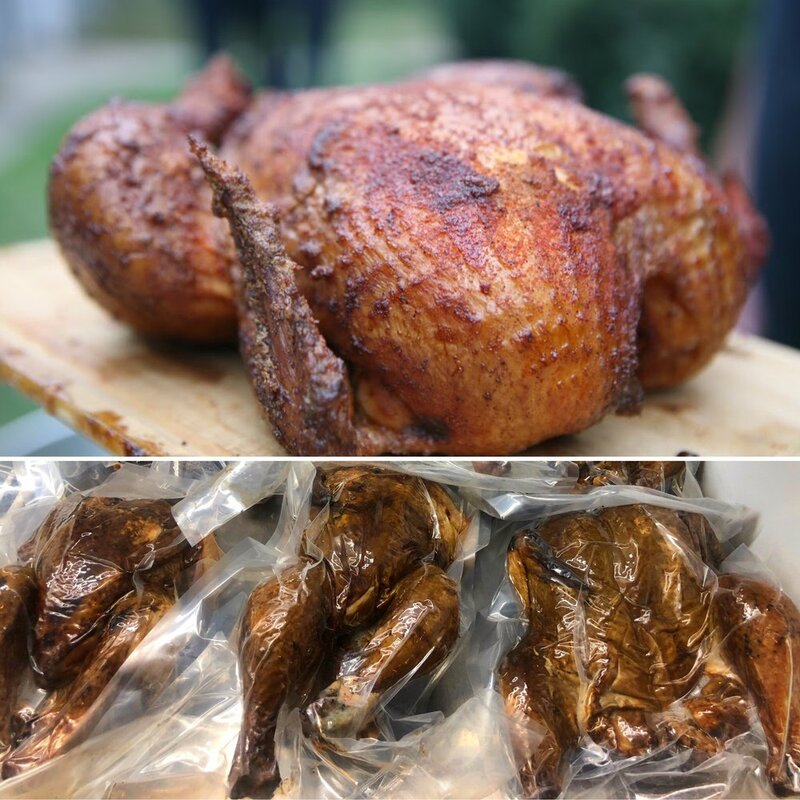 Whole Smoked Chicken: Hickory smoked and vacuum sealed. Smoked Bar Mix: Checked cereal, mixed nuts, rye chips, and breadstick crackers, drizzled with smoked butter, dusted with house-made seasoning, and hickory smoked. Blueberry Bacon Steak: An Indy Bacon Week special. VERY thick slice of bacon dipped in blueberry syrup and served on a skewer, lollypop-style. Beer Cheese Nachos: Kettle chips, shredded cheese, house-made beer cheese, pulled pork, Gomez BBQ sauce, Cholula sour cream, tomatoes, and green onions. Part of our dinner menu, available from 4:30-8:30 PM Tuesday-Friday and from noon-8:30 on Saturdays. Beer Nuts: Toasted mixed nuts drizzled with butter and dusted with brown sugar, Gomez Rub, salt, and pepper. Part of our dinner menu, available from 4:30-8:30 PM Tuesday-Friday, and from noon-8:30 on Saturdays. Fried Spanish Cheese: Dusted with salt and pepper and topped with Gomez BBQ sauce and hot sauce (optional). Served with toasted French bread slices.